It’s been a few weeks since the last update on our planned Special Issue, so here’s another one! We have now decided which abstracts we are going to include, and will be sending out the notifications shortly. Here, we’ll talk about the process we went through to get to the final list of 8 abstracts we are going to include. We first split up the abstracts, to make sure that at least two people had read each abstract. Then we met up to discuss the abstracts. 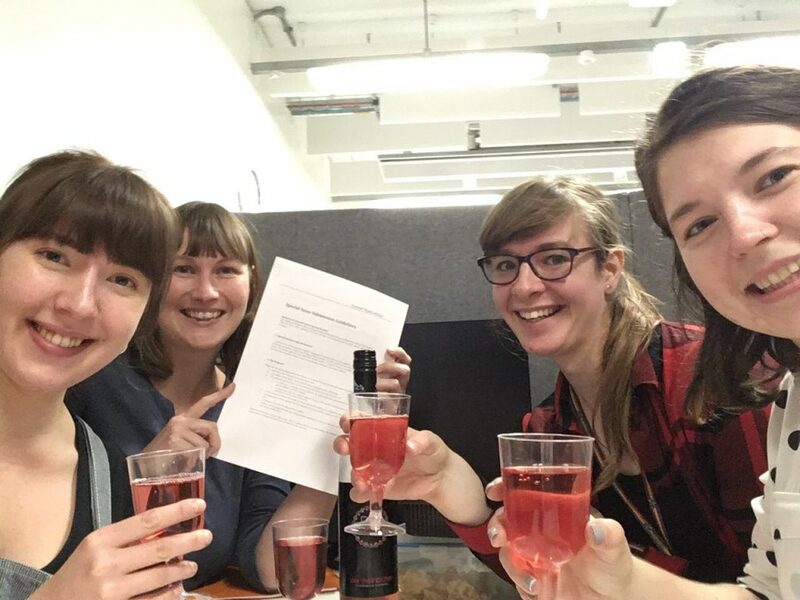 At this meeting, we had to make some very difficult decisions, as we didn’t think there was a single abstract in the 31 submissions that we felt couldn’t be published in a Feminst HCI venue! This one is really interesting, and I’d champion it! Once we had placed articles in these categories, we were able to get rid of a couple of papers that were in the 4th category. We were however left with a lot of papers at this point, and had to come up with a way of building a narrative for the special issue. We quickly realised that we could build a variety of different narratives, which would impact on which papers we’d accept. To make this a little easier for ourselves (or so we thought!) we now had a look at the authors of the papers for the first time. This was particularly helpful where there were papers that addressed somewhat similar research areas. In these cases, we foregrounded the work of those who are at earlier stages in their careers, or those papers we felt would not be published at more mainstream HCI or Feminist venues. We used post-it notes to write down main contributions of some of the papers. We also started to group papers into more categories – which we also labelled with post-it notes. With a couple more papers out of question at this point, we were still sitting in front of way too many papers. After some arguing about papers’ contributions, and some discussion as to why we thought certain papers were more or less strong within our narrative, we realised that we would not be able to come to a decision that day. After roughly 3h of deliberation we decided to call it an evening. A few days later, we met again to continue our discussions. We sat down again to try to build a narrative. 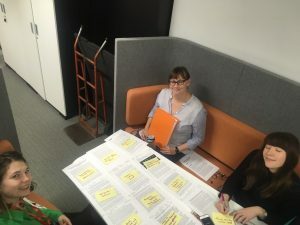 We pulled out some of the papers from category 1 and 2 and moved things about, and as we began to build our narrative, we also realised that there were some papers in category 3 that would now fit in much better. After 2h or so, we finally were able to build a narrative that we were happy with. 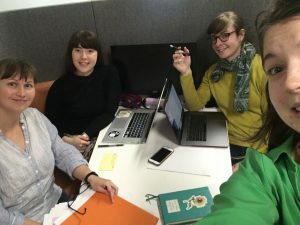 We felt it covered some very interesting areas of Feminist HCI research that addressed some contemporary concerns, some speculative feminist futures, as well as some actionable theories to build more nuanced discussions around Feminist HCI.